Actually you can buy what you see here. YOYO Schulz Newschool Freestyle deck; How it all started in 2001. Freestyle boards have been hard to come by the last few years. Unless you had an old one, or could shape your own, freestylers have been limited to the great board offered by Oldschool Skateboards.net or the Richie Carrasco 360 King deck, or a "mini" street board. Well, now there is another choice. YOYO Schulz, German freestyle ace, was not content to wait for the skateboard industry to make more FS decks, so he designed his own. Canadian maple -- manufactured in Germany. This deck is shaped very much like the old World Industries Rodney Mullen FS deck, which means it is an excellent shape. It is a larger FS deck, but still in the range that I would call a "traditional" FS board. Well, for starters the board is smaller than a normal street board - about 2" shorter. The nose and tail are shorter, as is the wheelbase. Flattened tail -- good for doing truck stand tricks. Rounded nose -- good for doing rail kickflips. Unlike the FS boards of the old days, this deck has mild, comfortable concave. Really nice. If you're like me, after riding concave decks for the last 10 years, a flat board feels pretty strange. This concave feels good under your feet, without being too severe. Kick nose: Yes -- the deck has a nice kick nose, upturned at a really good angle. Now, some freestylers do not like an upturned nose. I do. I think YOYO has selected a good angle for the nose. Great work. Longer wheelbase 13.5" In the last years of the "old freestyle" days, Mullen started doing bigger, faster moves. 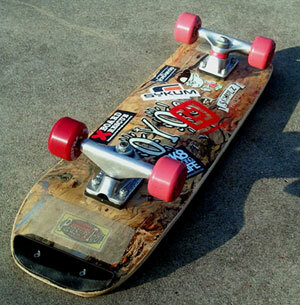 As a result, he increased the wheelbase of his board. The YOYO deck has this longer wheelbase. The longer wheelbase provides a more stable platform for your technical wizardry, but is still short enough to sling around. Cool. As you may know from reading this website, most freestylers use nose and tail skids. Since we're always balancing on the end of the nose or tail, and constantly scraping it up, you really need to use skids to make the board last. YOYO has you covered there too -- he makes custom tail skids for the board! They fit perfectly. Cool. Quality: the board is great. High quality. YOYO recommends Roll-Line wheels for this deck. They are actually "artistic" roller skate wheels from Italy! However, they are the same size as the old Powell Freestyle wheels, and also feature an offset bearing seat (they are not center set bearings). He sent me a set of these wheels, and I really must say that they are great. They have a hub with little holes, which makes the wheels light. 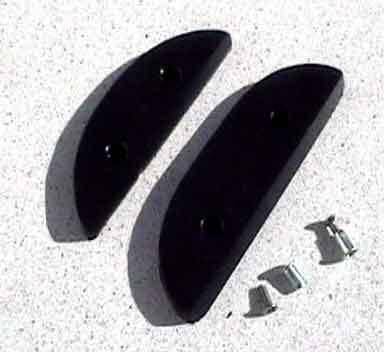 At 95a hardness, they are fast but smooth, and 57mm will let you roll smoothly even at lower speeds. Now, since they are roller skate wheels, they take a smaller bearing spacer -- which YOYO also has. After riding these wheels, I think they are probably of much better quality than any American skateboard wheel I've ever seen. They are obviously manufactured to tighter specs than skateboard wheels. I asked YOYO about it, and he said that the Italians are just really amazing with plastics and molds. It shows. I love my YOYO board. It is a ripping FS board. I think that most current FS skaters probably want a board that is bigger than the traditional sizes, and this is it. So, in closing, a big thanks to YOYO Schulz. You are doing a great thing for freestyle!